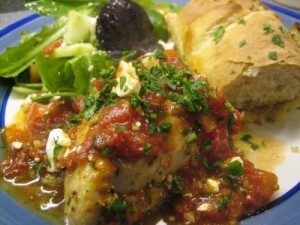 Chicken With Tomato Sauce recipe by Sana Muhammad at DesiRecipes.com. First mix Turmeric powder, salt , red chillies, and ginger . Then put small amount of water in it. Add this mixture with chicken in a way that chicken is fully soacked with salt , turmeric powder, and etc. Boil mix vegetable for 10-15 minutes in tomato sauce. Now transfter the chicken on a baking tray and pour tomato sauce mixture on the top. On the sides, lay down small pieces of potatoes so you can have crunchy chips when its ready. Put it in a oven at 375 c.
The chicken should be ready in about 1 hour and 15 minutes.